Visit these festivals and exhibits this month for a brighter holiday season, from the Holiday Lights at Garvan Woodland Gardens to the Arkansas State Capitol's display in downtown Little Rock. It's the most wonderful time of the year! Central Arkansas is ablaze with holiday light displays. Clear, multi-colored, twinkling, single strands or huge displays—we love them all! Visit these festivals and exhibits for a brighter holiday season, from the Holiday Lights at Garvan Woodland Gardens to the Arkansas State Capitol's display in downtown Little Rock. See more than 4.5 million bulbs transform approximately 18 acres into a memorable animated holiday display. As you amble through through the winter wonderland, your family can sip complimentary hot cocoa. On special Santa nights (6-8 p.m. Dec. 3-6, 10-13), families can have their photos taken with the big guy. Professional photographer Rebecca Peterman will be on hand to snap pictures, which will be available for purchase. Plus, check the schedule for free holiday concerts held in the Anthony Chapel throughout the season. Leave your pooches at home, except during the special Jingle Dogs Pup Parade on Dec. 3 at 5 p.m.
Holiday lights are on display 5-9 p.m. nightly Nov. 17-Dec. 31 (closed Thanksgiving and Christmas). Admission to Gardens is $15 for adults, $5 for ages 6-12 and ages 6 & under get in free. For more info, call 501-262-9300 or visit GarvanGardens.org. 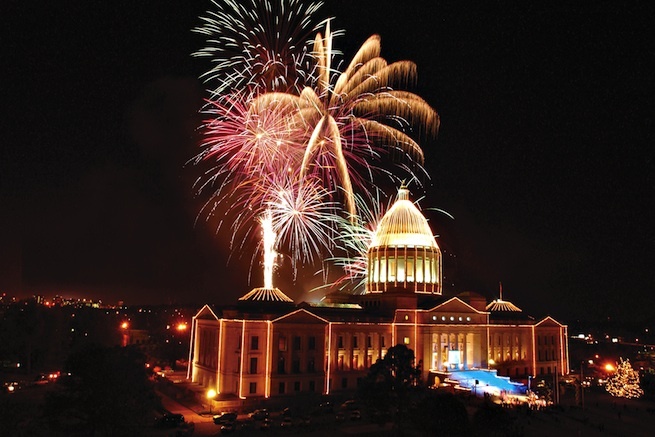 Following the Big Jingle Jubilee Holiday Parade (Dec. 1 at 3 p.m.) in downtown Little Rock, the State Capitol will be illuminated in its annual holiday display at 6 p.m. Santa Claus will help lead the festivities, which include fireworks, music and children's activities. And don't forget to take in the magnificent Rockefeller pine tree and elegant decorations in the Capitol building's rotunda. Holiday lights will shine each night Dec. 1-Jan. 1. For details, call 501-682-1010 or visit SOS.Arkansas.gov. FREE! Drive through this mile-long trail of lights in Sherwood Forest to spot over 90 brightly-lit displays. Don't forget to pick up a complimentary candy cane at the end of the trail. The entrance is at Sherwood Sports Complex, 511 Bear Paw Road. Admission is free but nonperishable items, donated to local food pantries, are welcome. Open from 6-9:30 p.m. Nov. 26-Dec. 30. For info call 501-833-3790 or visit CityofSherwood.net. FREE! Holiday lights shine and the animated tree show begins Nov. 25 and continues nightly through Dec. 26. The music and light show is approximately 20 minutes long and plays each hour on the hour from 5-9 p.m. Take free photos with Santa & Mrs. Claus from 11 a.m.-4 p.m. on Dec. 1 and 1-6 p.m. Dec. 8. With questions, call 501-821-5552 or head to ChenalShopping.com. FREE! Jacksonville residents will channel their inner Clark Griswold to compete in the city-wide contest! Homes, churches and businesses in the Jacksonville city limits are eligible to compete. If you're driving through town to ogle the displays, be sure to call and nominate your favorite for a prize! Judging takes place after 6 p.m. on Dec. 18. For info call 501-982-4171 or visit CityofJacksonville.net. FREE! 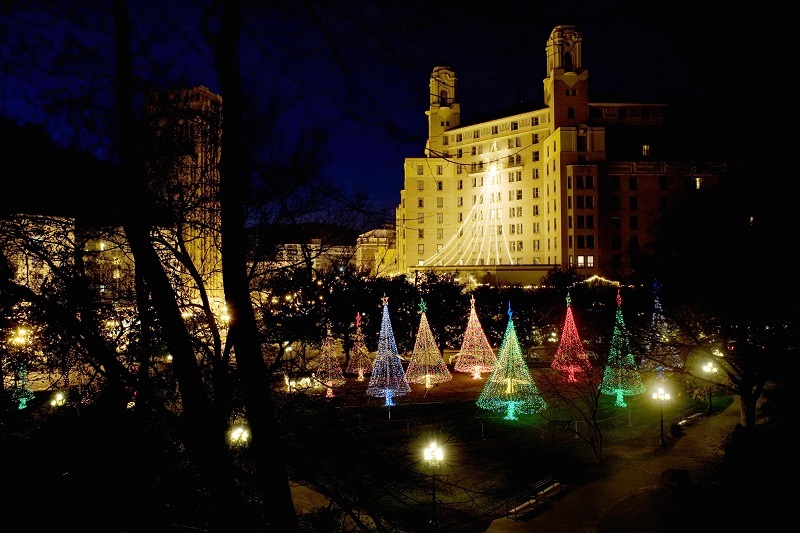 Swing through downtown Hot Springs to see its annual light display along Bathhouse Row starting on Nov. 19. While you're there, stop by the Arlington Resort Hotel and Spa's lobby to see the giant gingerbread house and Christmas tree. The hotel is located at 239 Central Ave., Hot Springs National Park. For info: 501-321-2277. FREE! For more holiday light displays throughout the state, visit the Arkansas Parks & Tourism Trail of Holiday Lights website.